The floor is in! Plug welding turned out to be the way to go, at least for the interior tubes. It did take quite awhile to mark, drill, and deburr 58 holes, but they all lined up and we were able to move around quite a bit during the actual welding, and so the floor never got really hot in any one area for very long. 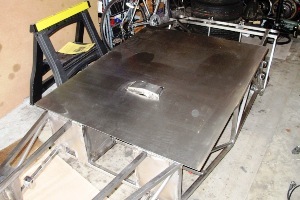 We didn't weigh the floor before we welded it on, but it wasn't nearly as heavy or unwieldy as we thought. It arrived on a truck with a shipping manifest that listed it at 100 lbs., but at least half of that was the weight of the huge pallet it was strapped to. 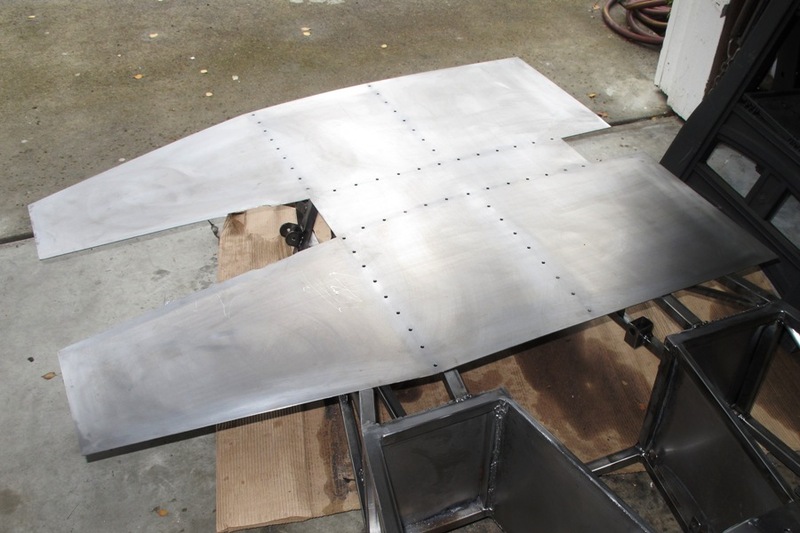 A Locost floor, after trimming to fit, is usually found to weigh around 35 lbs., but of course ours is lighter due to the 58 plug weld holes. Still, we had to be a little careful hauling it around, since we wanted it to remain flat, which we think is a key component in a floor. Trimming the sheet metal for the floor wasn't all that difficult, once we cut a hole for the transmission mount so the floor could lie flat on the frame. Somehow we didn't cut the hole too big, which was a pleasant surprise. Another pleasant surprise, this large piece of steel which was presumably cut perfectly square—most likely on a highly accurate hydraulic shear—matched the edges of our frame perfectly. Despite all the welding the frame has seen over the past 7 or 8 months, it still appears to be straight. We managed to cut the floor to the right size and shape, and drilled all of the holes without any major damage, but we do have one tip for future Locost builders: Don't use your frame as a workbench for cutting up large pieces of sheet metal, even if you're absolutely sure there's nothing underneath what you're cutting. If you somehow forget this tip, don't worry, chances are good the damage will be minor, probably only a slight gouge in a small transmission tunnel tube, easily repaired with your MIG gun and angle grinder. One thing we found out about plug welding is that you have to be a little careful about spending too much time on any one plug, because the metal between the plugs is still free to bend if it gets too hot. But we only had that happen once, and we fixed it with a hammer and another plug. So between all the measuring, marking, fitting, drilling, and welding, the complete job of attaching the floor to the frame took all day, but it came out really straight, and it's way sturdier than we ever expected. Having a floor in the car is excellent. 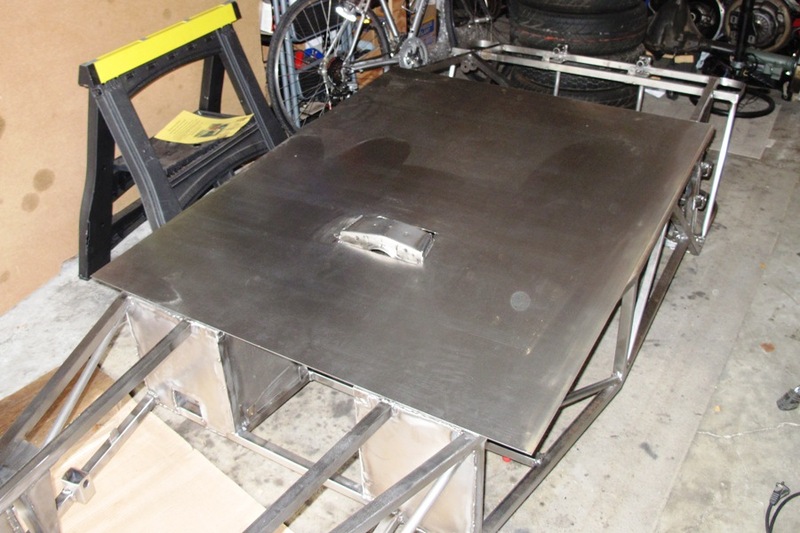 First of all, it really looks like we have a car chassis now, and not just a bunch of welded tubes in the shape of a car. Second, when you're sitting in the car, you're actually in the car and not on the floor of the garage. Third, the floor of the car is now the perfect spot to keep tools and parts that you're likely to misplace. Having tools on the floor of your Locost has for many years been a sure sign that you're in the late stages of your build, about to drive it away any day now. We think we'll be driving our Locost in about four months. This estimate isn't based on any concrete plan, but on how the build has gone so far. We'll be able to make a better assessment after the frame is painted and we start installing the wiring and plumbing, but for the first time in forever it doesn't feel like there's way too much to do. To get the car running we don't have to get every last wire hooked up, just the main components like the battery, starter, alternator, and the ignition. We don't need a full dashboard. We don't need lights. We don't even have to have a radiator fan for our first test drive. A lot of Locosts on their first drive didn't have a radiator. 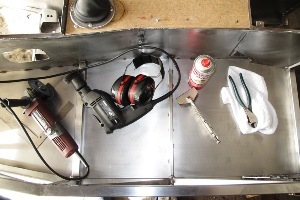 We'll have our fuel system completed, and the brakes will be fully sorted. 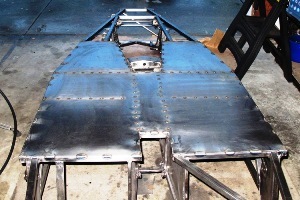 The rest is all stuff we've already done, like the suspension, steering, exhaust and the transmission tunnel console. So we're pretty excited about it. The weather should be great for some epic top-down driving in late March or early April, even if that driving is restricted to about 4 miles from the homestead. Automotive Welding: A Practical Guide is a must' for any library srontg on shop or automotive repair. 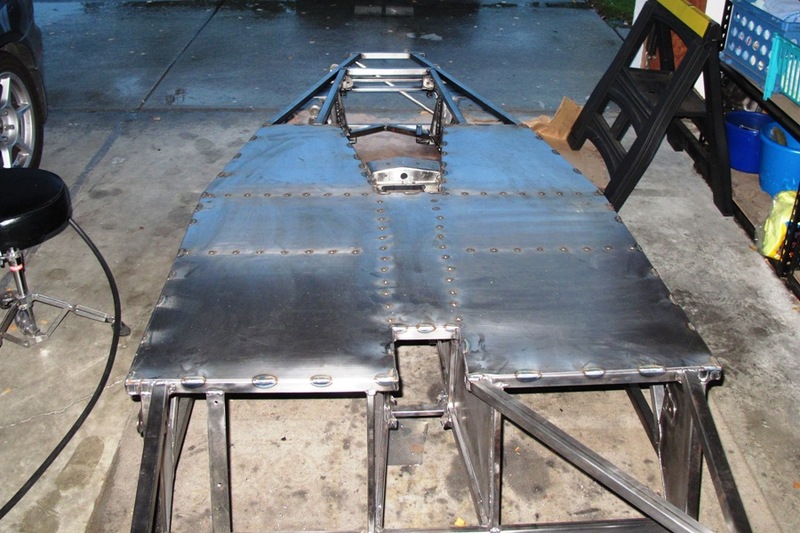 It covers all the basics for amateurs using inexpensive or rented tools and little experience, offering common auto metalwork projects form repairing a cracked manifold to fabricating a roll bar. 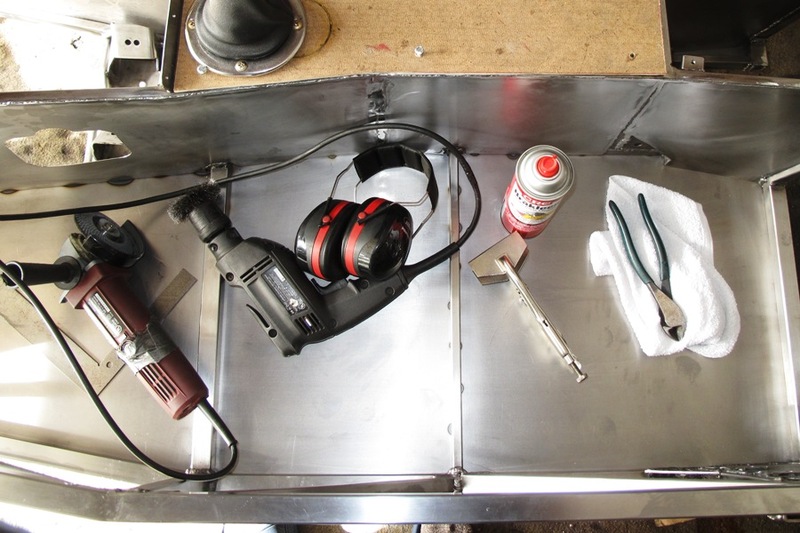 While the projects relate to real-world experience, their sum allows for an actual complete course' in all the different auto welding options, making this a top recommendation for all kinds of libraries.